If old truths are to retain their hold on men’s mind, they must be restated in the language and concepts of successive generations. What at one time are their most effective expressions gradually become so worn with use that they cease to carry definitive meaning. The underlying ideas may be as valid as ever, but the words no longer convey the same conviction; the arguments do not move in a context familiar to us; and they rarely give us direct answers to the questions we are asking. Hayek went to lengths throughout his career to restate the meaning and to defend the importance of the old truth of liberty. His understandings are profound, weaving together technical economics, epistemology, political philosophy, ethics, and anthropology. Working in the great tradition of Scottish philosophers David Hume and Adam Smith, Hayek was a true student of civilization, a practitioner of the science of man. Hayek, though often mentioned in intellectual discussions and cited in academic papers, remains somewhat poorly understood. Like Adam Smith, he is often treated as a figurehead for a naïve ideological platform of “laissez faire” and a proponent of a simple-minded conception of “market efficiency.” But Hayek’s strong advocacy of liberty and its institutional counterpart, private property, is not naïve, nor is his view of the market simple-minded. His liberalism grew over decades of serious scientific study and emerged out of a rigorous analytical and philosophical framework. Today, when liberty seems to be ignored, misunderstood, or denigrated in domestic and international politics, Hayek’s thought is as relevant as ever. The way in which Hayek restated the old truths of liberty is worthy of our continued attention. 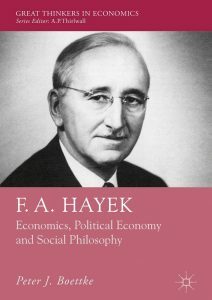 In an excellent new book, F. A. Hayek: Economics, Political Economy, and Social Philosophy, Peter J. Boettke reconstructs Hayek’s intellectual project and argues for the continued relevance of his ideas. Boettke shows us the richness of Hayek’s work and the interconnectedness of the various strands of his thinking. The emergent theme of the work is the sophistication and importance of Hayek’s science of liberty, which Boettke uses both to inspire future academic research and to heighten our regard for liberty and the institutional frameworks that support it. In this fine work of intellectual history, Boettke artfully sketches the historical context in which Hayek’s various ideas developed while demonstrating their analytical connection and broad coherence. Hayek’s career began in the 1920s in Vienna, where he worked with his mentor and colleague, Ludwig von Mises (1881–1973), on monetary theory, capital theory, and business cycles. Boettke suggests that Hayek’s intellectual contributions both to economic theory and to the science of liberty are best understood in the context of Mises’s work on coordination and social cooperation. In the early 1920s, Mises was engaged in a debate—to which Hayek would later contribute—on the productive potentialities of socialism versus markets. Mises argued that socialism could never be more productive—that is, produce more things people actually value at the proper time and place—than a market in which the means of production are privately owned. Profits and losses, made possible by private ownership, create an effective feedback loop between consumers and producers by remunerating producers only insofar as they produce things that people actually want. Drawing on insights from this debate, Hayek went on with Mises to analyze how price and interest rate signals drive investment decisions, coordinate the process of capital formation, and determine the nature of the structures of production. In so doing, they formulated a compelling theory of the business cycle. The perspective developed in his early work with Mises was foundational to Hayek’s subsequent intellectual developments. From his early study of money, capital, and business cycles, Hayek’s career turned more directly towards what Boettke sees as the main arc of his thought: “epistemic institutionalism,” or an exploration of the knowledge properties of various social and political arrangements. Boettke’s treatment of Hayek’s thought in terms of epistemic institutionalism is a helpful framing of Hayek’s intellectual vision. It is among the primary contributions of the work. In essence, Boettke’s framing emphasizes how Hayek came to see the virtues of liberty and its facilitating political arrangements in his recognition of their uncanny ability to make effective use of a host of dispersed and highly personalized knowledge to advance and harmonize individual and social ends. This turn in Hayek’s career started in the 1930s when he won a position at the London School of Economics (LSE). While working at LSE, he came to engage with and dispute the economic ideas of one of his intellectual rivals, Cambridge economist John Maynard Keynes (1883–1946). Hayek’s ideas fell out of favor in the wake of the Great Depression; Keynesian macroeconomics and its recommended programs of government stabilization and fiscal stimulation ascended. Hayek felt that this ascendancy reflected a lack of basic understanding of the function of prices and interest rates in social coordination and, more importantly, a failure to recognize the necessary institutional arrangements—namely, private ownership—presupposed in neoclassical economic analysis. This feeling was compounded by his concurrent engagement with market socialists who believed that the price system could be used by central planners stripped of its institutional underpinnings of private ownership. The economics of Hayek’s intellectual opponents focused on a state of affairs called “general equilibrium,” in which a society’s resources are effectively used and allocated such that each person is content with their lot given the prices of goods and services such that no one person could be made better off without reducing the welfare of someone else. In careful detail, Boettke explains why Hayek thought that the focus on general equilibrium and the mathematical conditions that defined it came at the expense of considering the actual social process by which a state of equilibrium might be reached. Hayek’s economics became much more concerned with states of disequilibrium and the process by which societies exchange and move towards more efficient uses of resources. Boettke engagingly extends Hayek’s concerns to critically comment on the formalism in modern economics and the extent to which it ignores Hayek’s insights, along the way canvassing an alternative Hayekian interpretive paradigm that we might use in our own economic deliberations. Building on his earlier work with Mises, Hayek came to see that prices are the essence of society’s coordinating economic process. New York City, far removed from most of its food sources, is fed on a daily basis thanks to the price system, which operates to coordinate resource flows across both time and space. Price formation occurs as resource owners engage in consensual trades. Each trade reflects highly individualized values and knowledge. Over time, a whole constellation of prices emerges, each individual price reflecting a vast sum of individual values and knowledge. In relying on prices in our daily activities, we are metaphorically accounting for highly individualized and dispersed sets of value and bits of information. Each individual contributes to this vast system of spontaneous order by simply acting on her interests—no central mind designs the outcome. Boettke thus shows how through his study of the price system, Hayek came to appreciate the insight of Scotsman Adam Ferguson (1723–1816) that the economic order was the result of purposive human action, but not of design. That order, he saw, depends crucially on liberty: without the freedom to make and refuse trade offers, and to buy and sell goods and services, the economic order regresses. In the later chapters of the book, Boettke shows how Hayek’s work on price theory, with its emphasis on knowledge, naturally spring-boarded him into political and legal studies. He argues that Hayek’s turn from more technical economics towards social philosophy was not, in fact, an ideological move, but an analytic one. Hayek saw his opponents as not only misunderstanding the basic function of prices and operating on unrealistic assumptions about their knowledge; he also came to see that they simply, as Boettke puts it, “brushed aside” the “underlying institutions that enable fallible, but capable, human actors to coordinate their affairs with one another.” His intellectual project consequently spiraled upwards and outwards from technical economics to analyze the nature of the social framework within which peaceable economic transactions can take place and the principles of political organization necessary to sustain that framework. In other words, in articulating his economic theory, Hayek found need to turn to analyze and defend the institution of property and the political framework that it presupposed. Boettke convincingly shows that Hayek was not an economist who turned to politics, but a thoroughgoing student of civilization who, through the consistent application of principles of classical political economy, turned to the analysis of institutions. The book culminates in a restatement of Hayek’s liberalism and a challenge to scholars and public intellectuals to continue his work. Hayek’s science of liberty and his conception of what economists and social thinkers should do coevolved as he became more and more convinced of the limited effectiveness of deliberate reasoning and central control in the social world. The economic order is a product of action, not design; the political and social institutional order in which the economic order exists, moreover, are themselves a product of a moral and cultural order, developed over generation upon generation. The task of the Hayekian liberal is to show the effectiveness of liberty in its unmatched ability to harmonize individual and social ends, investigate and promote the political underpinnings which support it, and cultivate an appreciation for the necessary virtues upholding liberty in the modern world—dignity, respect, reciprocity, justice, and the like. Boettke’s book is rich in its contextualization of Hayek’s ideas and its engagement with modern issues in social science and public policy. The application of Hayekian ideas spans from the 2008–2009 financial crisis, to political theories of democracy, to evolutionary psychology. As Hayek restated the ever-important truths of liberty, so Boettke has effectively restated and demonstrated the ever-important truths of Hayek. His great work is a source of inspiration in our continued intellectual and cultural fight for liberty. Erik W. Matson is a postdoctoral fellow in economics at New York University and an online lecturer at The King’s College, New York. He researches the history and philosophy of economics, specializing in David Hume and Adam Smith. Some of his recent work has been published in peer-reviewed journals including The History of European Ideas, The Adam Smith Review, and The Journal of Scottish Philosophy.